We have all heard stories of people going in for a routine procedure and acquiring some sort of horrifying while in the hospital. Though hospitals may follow a thorough cleanup and disinfecting routine on every room, there are times when some of the tough bacteria are still lurking around. To address the increasing rate of hospital-acquired infections, a powerful robot is now being used to complete disinfect every patient’s room in just five minutes! 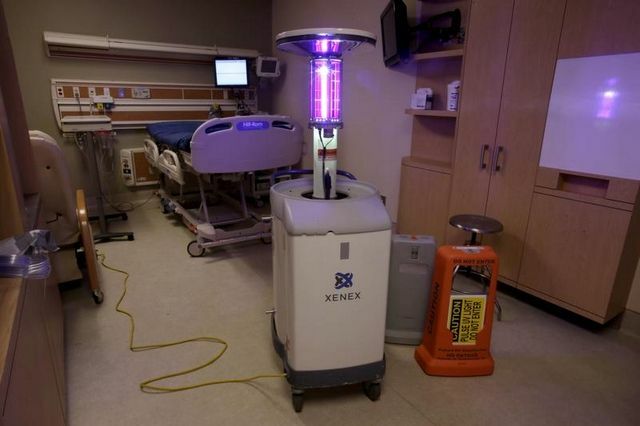 St. Anthony Hospital in Oklahoma City is now utilizing the capabilities of a 5-foot-2 robot called Xenex to spot bacteria inside a room and kill them. This four-wheeled robot is able to identify bacteria even on nooks and high surfaces so every spot in the room is guaranteed clean and safe. Rachel Sparks, the technical director of Xenex, said that the robot can be placed inside the room for five minutes and in that time it can instantly clean the room. After a normal cleaning from the hospital staff, Xenex will then be placed inside the room alone. Its top comes up and shoots a strong UV light that comes from an internal bulb. Once the UV light hits a bacteria cell, it fries the cell wall as well as its DNA so it cannot reproduce and dies. This revolutionary way of hospital cleanup has been proven effective given that cases of hospital-acquired infections at the hospital have reduced significantly. Now, patients and their visitors are more at peace in a safer room inside the hospital.